Description: This ascidian forms an extensive transparent sheet over rock surfaces and other hard surfaces. The small zooids are visible as clustered groups scattered densely throughout the sheet. There are a few conspicuous oscula-like exhalant openings, normally marked with white or bluish-white pigment. There may be pigment patches at the surface of the sheet, and the inhalant pores above each zooid may be ringed with pigment. This ascidian has been mistaken far something dead and rotting but is in fact a perfectly healthy organism! It is one of the most sponge-like ascidians. 3mm thick x 300mm wide sheets. 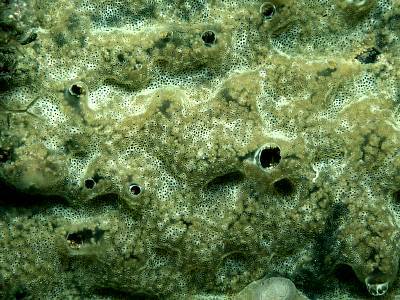 Habitat: A common ascidian in a wide variety of habitats, from sheltered to exposed conditions. Distribution: Widespread and common on western coasts of the British Isles - possibly elsewhere. Similar Species: Diplosoma listerianum forms smaller transparent colonies, usually on seaweeds. Many small inhalant and fewer large exhalant pores. Zooids in small groups, pigmented. Picton, B.E. & Morrow, C.C. (2016). Diplosoma spongiforme (Giard, 1872). [In] Encyclopedia of Marine Life of Britain and Ireland.